Ahh..the rains, there is something oddly festive about the monsoon. Rains not only switch on the romance in us, but also fire up our appetite, and craving for particular snacks. The gracious weather just triggers your enthusiasm to munch on greasy, hot and crispy treats that form the highlight of the monsoon experience. And these indulgences are sure to wash away the hard work that you put in a few months ago to get your weight back on track. 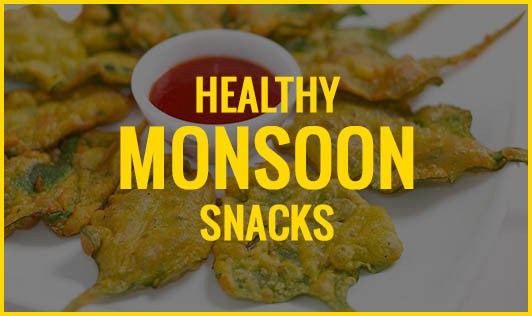 Here are few healthy substitutes to your favorite monsoon snacks. Onion Pakodas, bread pakodas, aloo bonda and mirchi bajjis with a cup of hot piping tea is everybody’s favourite in the rainy season. Since these snacks soak in a lot of oil when deep fried, it directly has an impact on your weight and your cholesterol levels. Substitute: Grilled sandwich with some fresh crisp vegetables with little cheese for taste is the best substitute. Roasted papad of your choice with lots of grated and finely chopped vegetables on it with some seasoning is also a good. It is appetising, tasty and healthy any day. Samosa and hot tea is an excellent combination, whether or not it rains. But for some, it can cause a stomach upset with acidity and also contribute to your weight when had regularly. And, added to the fact, the oil used for deep frying can be of low quality with repeated use of same oil for several days. Substitute: Aloo chaat, aloo dahi chaat or baked aloo chaat. It is simple, healthy, delicious and filling. There is nothing that can beat the taste of this snack! This quick mouth-watering snack is easily available on any roadside. But indulging on this can cost your health. With waterborne diseases high in the monsoon, you can never be sure about the hygiene aspect of the water used and the cleanliness of the vendor’s hands. Substitute: Nothing can substitute golgappas! It is comparative low in calories when compared to other greasy snacks. It’s just the hygiene you need to be concerned about. Make your own plate of golgappas at home and enjoy it with your family. These South Indian delicacies are a must snack in most households. With pleasant weather outside, it might be very tempting to grab a packet of crispies of your favourite brand. But, snacks made out of rice absorb a lot of oil. So, be careful when you choose your snacks. Substitute: A sprouts salad, a vegetable salad or corn salad with your own assorted vegetables and simple seasoning can make your snack colourful and yet appetising. You can even add fruits like pineapple and pomegranate to your salad. We often lose count of the number of sachets we finish of this pass time snack. We become totally unaware of the quantity we eat, and that can affect our calorie intake for the whole day. These types of snacks can be disastrous to health, as they are usually deep fried in old oil and are kept fresh using chemical preservatives. These snacks when taken for prolonged periods can lead to hypertension and dyslipidaemia. Substitute: Make your own puffed rice or rice flakes snack with ingredients of your choice. It tastes delicious and you are also low on your calories!